Looking for an intimate wedding venue? 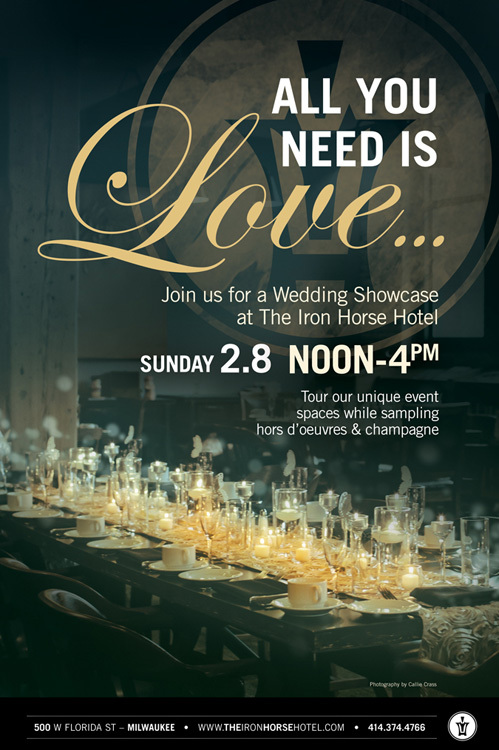 The Iron Horse Hotel is hosting a wedding showcase on February 8. There, couples will be able to tour the hotel’s unique event spaces (both indoor and outdoor), meet vendors and sample select hors d’oeuvres and champagnes. The Iron Horse Hotel is known for its unique and intimate atmosphere, similar to what you’d find at a boutique hotel in New York or L.A.
Plus, the hotel is giving couples a chance to win a $1,000 credit towards a wedding ceremony or reception at the hotel, through a “Pin it to Win it” Pinterest contest that will be kicked off at the Wedding Showcase. When: Saturday, February 8 from noon-4 p.m. Participating vendors: Welke’s House of Roses, Dahlia Blooms, Eat Cake, Scottfree Salon, Blush Beauty, Rick Hill Weddings, Craig John Photography, Bucci’s Bridal, Coqui Design, Front Room Photography, Wisconsin Photo Booth and Creative ice.